Transportation from the airport was arranged for us through Go Punta Cana, it is a quick and easy ride from the airport. " The unit, in our opinion, is perfectly placed in the complex. Located at the edge of the pool, as well as providing an excellent view of, and access to the beach. What the unit had in it either worked, or upon being notified, was quickly fixed. The only issue with it is what is missing. And in fairness we left a list of the needs with the rep who closed off our rental, so they know this info. Settling into this unit is like moving into college residence, it has the bare bone basics, but is missing the things that can make it a home away from home. Things like anything to measure something, like cups or spoons to measure will be helpful. Also a cup for coffee would be great. As well, in the humid salty environment anything with a battery needs monitoring to ensure it operates. This is not done regularly, and the proof is a wall clock with the battery corroded in place. It looks exactly as the pictures presents, and is very very clean. It just needs a little “owner” pride and character to be added to it to make it perfect home away from home." I love the location and the condo has just about everything you need. It does show it's age but is clean. Yes, I would stay here again. The pool bar was closed for remodeling but the bar on the beach was open and has good food and drinks. " A super pleasant stay, great location of unit and close to day trips. " Unit was clean and maintained. One bedroom unit was a good size for 2 people. The additional bathroom also makes it roomy enough for 4 people with a pull out sofa. Bathrooms show their age, but were clean. Unit has 2 ACs, one for the bedroom and the other for common areas. It is possible to have the living area cool during the day and turn the bedroom AC on to sleep. Unit is near the pool, making it noisy at times during the day. " Super easy & very clean unit. So close to everything you need. The beach here wasn't that nice so we took a taxi to Macao. It was worth it & so beautiful. We didn't rent a car but if you feel like you can drive in that crazy Los corales traffic, then that would be the thing to do. Super impressed with Go Punta Cana! They always answered and helped with the utmost priority. We will use again! Can't wait to go back! Eat at Kats! Wacamole! And Dalias! " The lack of these things in no way took away from the amazing trip we had. The condo location is wonderful! Pool and ocean view. Close to everything! The guys at the restaurant on the beach are amazing and it was also the best meals we had! Citrus & Don Pio were very good too! We tipped well and the gratitude was overwhelming! The best workers and people I've ever encountered. This was my 7th year to Punta Cana, my second year at Playa Turquesa. We will be back to Playa again! It definitely had the best beach and set up north or south of us!! Don't waste your time on all-inclusives. This is a much better overall experience!!" The location of this condo is wonderful. In walking distance from the condo you have a variety of eating establishments, grocery stores. The beach is a short 5 minute walk. 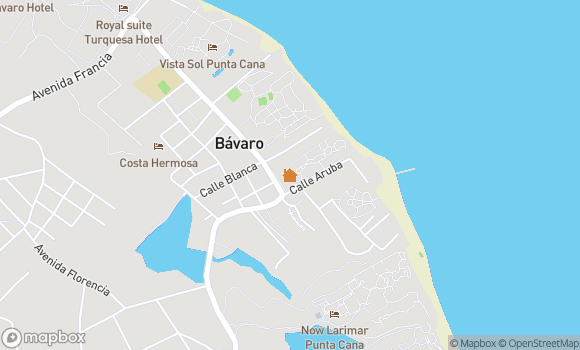 This condo is located in the heart of the Bavaro area offering everything you would ever need on vacation. " This unit is overall pretty good. It is fairly clean and nicely remodeled. The pictures don't show how small the bedroom or master bath is, however. The second shower, which we never used, is tiny. The washer & dryer worked well and the a/c worked great. There was a big group of us staying in multiple units and this one was not as nice as others. Bathroom always had an odor and toilet lid would not stay open when sitting on the toilet, so I probably would not rent this unit again. The property management company was extremely professional & helpful and I would definitely rent from Go Punta Cana again. We had a fuse blow and had no hot water and they came out with in a few minutes! The electricity deposit worried me a little at first, but they showed us the meter and did the calculations right in front of us. Very trustworthy & helpful. " We stayed in this ground floor condo for 3 weeks this winter. This was our second time staying at Playa Turquesa. This condo is exactly like the pictures. We loved the well-equipped terrace. It gives lots of shade from the hot sun. The gas BBQ was great for those nights we didn't want to dine out. There are many restaurants close by and a couple of small grocery stores within walking distance. The bed was very comfortable. The internet in this unit worked perfectly. The only thing missing was a stand to hold the large water jug or at least a pump. There are lots of chairs on the beach and more room to sit than at a resort. The grounds are beautifully maintained. Kudos to the gardeners. " "Very pleased with condo and great location. We were very pleased with our rental. One note, the condo (complex) is not new as mentionned when we rented. But all furniture (except fridge) in condo is new and very nice. The king bed is very confortable. I rated cleanliness 4: bathrooms are not new, not spotless, but clean. We found everything we need in the condo. It was exactly as pictures. The spot is great, chairs on the beach, fruit stand, market and pastry next to complex. Many restaurants within a 5 minutes walk. Our favorite restaurants Citrus (watch your change, we had a bad experience), Dalia's cafe (not only for breakfast) and Pastrada. We were pleased with resto Don Pio (very good sangria), Garry's bar and Balicana. Go Punta Cana was helpfull (explained about electricity, sent someone to see fridge shortly after my email), fast & easy check in and check out, taxi they sent was at time. I felt they were reliable. "